The start of the week saw a quiet start to the contest with light southerly winds keeping the women on hold. However, on day 3 the wind switched back to the north and allowed the single elimination to be completed in float and ride conditions with waves in the head to logo high region. With light winds and only wave riding to count, wave selection and tactics were crucial in order to be successful and some sailors faired better than others in that aspect. However, right from the word go Iballa Moreno looked to be in a superb form as she effortlessly booked her place in the final. In both the quarterfinal and semifinal Iballa had quickly managed to registered a solid wave score to settle any nerves, but in the final the 9-time world champion was forced to wait and her patience was really tested, but in the end her patience paid off as she struck late - producing her two highest wave scores with her last two waves - to overtake long-time leader Sarah-Quita Offringa (Starboard / NeilPryde / Maui Ultra Fins). Iballa's speed, power, and flow mixed with a variety of turns, floater, and aerials, proved too much in the end as she claimed a deserved victory to make the perfect start to her title defence as she goes in search of world title No.10. Sarah-Quita Offringa improved with each heat she sailed in Morocco and for a long time, it looked as though she may deny both of the Moreno twins. While both Iballa and Daida opted to be more selective and patient, Offringa chose to stay busy and for a long time it looked as though those tactics were going to pay off, however, she couldn't quite hold on as Iballa fought back to clinch top spot. However, Offringa will be delighted with her start to the season as she equals her best start to a wave season - 2nd - after also finishing 2nd during the 2016 Gran Canaria Wind & Waves Festival. Multiple time world champion - Daida Moreno - completes the podium in the season opener and she'll be even more of a threat in the coming events in both Gran Canaria and Tenerife. Daida was in contention throughout the final - landing two aerials on one wave - but couldn't quite find the second score she required to pass either Iballa or Offringa. Although there were a few close calls en route to the final all four of last year's top four qualified for the final with Lina Erpenstein (Severne / Severne Sails) also navigating her way into Heat 15. The German's crash course in starboard tack wave sailing in Tarifa a few weeks prior to the world cup here clearly paid off and she'll no doubt be delighted with her start to the season and you can expect to see her get even stronger over the rest of the season as she returns to her favoured starboard tack. France's Marine Hunter (KA Sail) caught the high immediately in the semifinal as she won her quarterfinal ahead of last year's world No.3 - Sarah-Quita Offringa - after a series of late hits and no fear approach. The 25-year-old came within seconds of qualifying for the 4-girl final, only to be denied as Daida Moreno produced a buzzer beater. That means Hunter walks away with a joint 5th place alongside Spain's María Andrés (Fanatic / NorthSails). Elsewhere, Arrianne Aukes (Fanatic / NorthSails), may feel she missed out on an opportunity to make the final after making an excellent start to Heat 14 - scoring 6.38 points - but then couldn't find anything better than a disappointing 2.38 point wave, which may have partly come down to wave selection. The 31-year-old finishes 7th here - alongside Italy's Serena Zoia (99NoveNove / Loftsails) - and will no doubt learn from the experience with another wave event under her belt as there were plenty of positive signs. 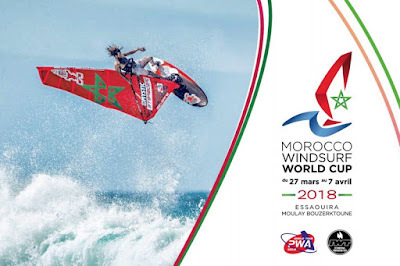 After Day 3 the Atlantic Ocean produced several days of massive swell, which saw Boujmaa Guilloul deliver a world-class display for the onlooking crowds as he tamed double mast high waves and launched into 60-foot jumps. The Men's Qualifier began on the 27th March and was completed by the 31st March in epic conditions with strong winds and waves mast to mast and half high. 4 men lined up in the final - local hero Boujmaa Guilloul, two-time Aloha Classic champion Morgan Noireaux (JP / S2Maui), Guadeloupe's Antoine Martin (NeilPryde) and Japan's Takara Ishii (RRD / RRD Sails) - with the 17-year-old earning his place in the qualifier by winning the youth division. Come the end of the final Antoine Martin clinched his first ever event victory after landing a massive one-handed backloop, while landing radical goiter after goiter combined with some seriously late hits to deny Noireaux and Guilloul - with Ishii finishing 4th. The PWA would like to extend their thanks to Boujmaa, who has been integral in bringing the PWA to Morocco, and also to all of his fantastic team and sponsors, without whom it would not be possible. After a great event, we hope to return next year. After the first wave event of the year attention now turns back to the race course as the fastest men and women in the world prepare to battle it out on the Asian leg of the tour, which will see them traveling to Japan, followed by Korea. For a full recap from Morocco - including elimination ladders, entry list, images and live ticker simply click HEREand scroll to the bottom of the page.